Today we take for granted comedy TV shows like ?The Office?, ?Two and a Half Men?, ?My Name Is Earl? and others. They are ?sitcoms? short for situation comedies. What?s the history of the sitcom? How did we get to the comedic form we are all so familiar with. Sure there are roots in theatre from Shakespeare on through Vaudeville, but mass market sitcoms started first on radio twenty years before the first commercial TV comedy. 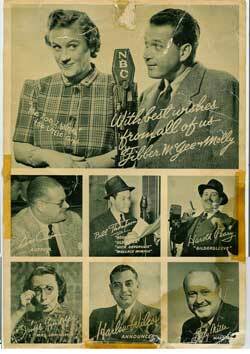 One of the first, and by far the most sucessful radio comedy shows was ?Fibber McGee and Molly?. It ran on NBC from 1935 thru 1959. Twenty four years is a long run for any show, radio or TV. The Cast of ?Fibber McGee and Molly?. Click for a larger version. The show was created by Jim Jordan (Fibber McGee), Marian Jordan (Molly) and the show?s writer Don Quinn. Not only was he the creator of the show, but for many years was the only writer on the show. Don Quinn grew up in Grand Rapids, Michigan. As a young man he had a paper route that included homes as well as businesses. One business was Kremer?s Rexall Drugstore at the corner of Franklin and Eastern. 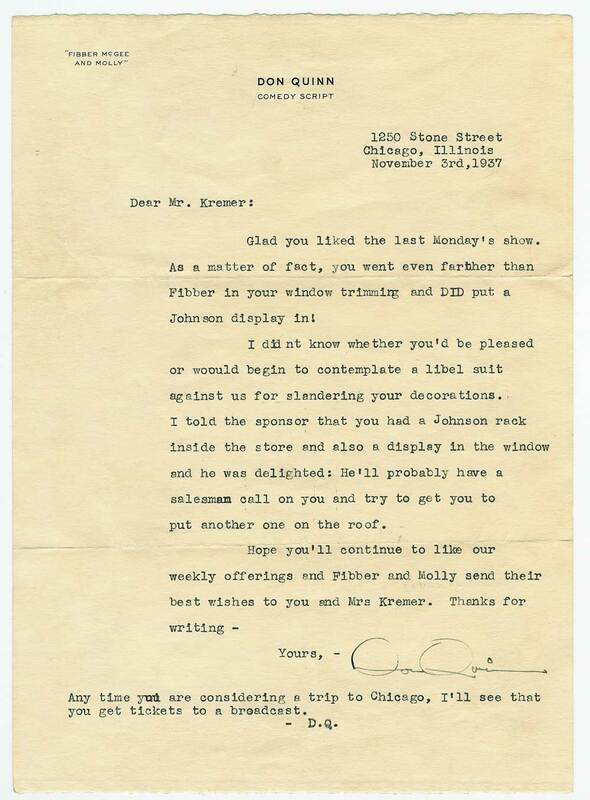 The store was owned by my grandfather, Edward Kremer. He was the pharmacist and ran the store. Back in those days a pharmacist was often referred to as ?Doc? so my grandfather?s nickname was ?Doc Kremer?. 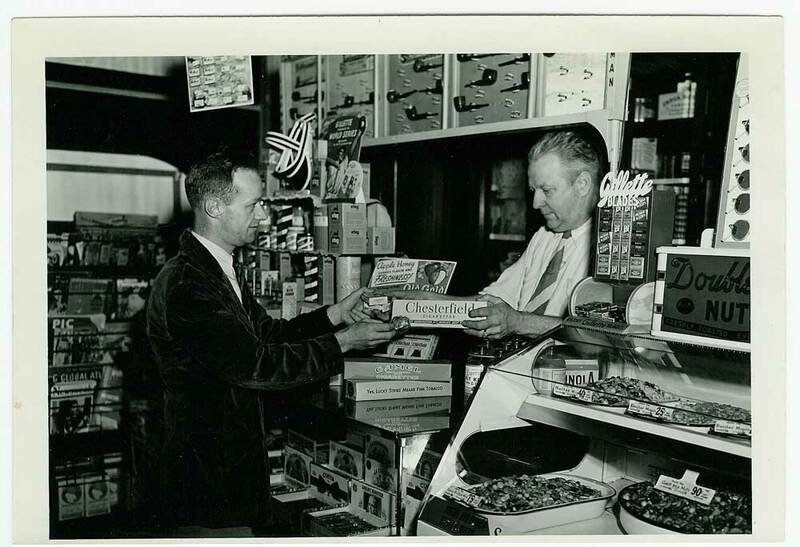 His store included an old fashioned soda fountain and Don Quinn used to stop by on his route for a soda. He and Doc Kremer became friends. After he moved on to Chicago to create ?Fibber McGee and Molly? he added Kremer?s Drugstore to the show as well as the character of Ed ?Doc? Kremer. Kremer?s Drugstore and Doc Kremer made appearances during the complete run of the show. ?Kremer?s Drugstore? and ?Doc Kremer? also were referenced on the TV show ?Petticoat Junction? a show that was created and written by former ?Fibber? writer Paul Henning. Recently I was given the original letters that Don Quinn sent to my grandfather as well as a page from an original script from a 1944 show. 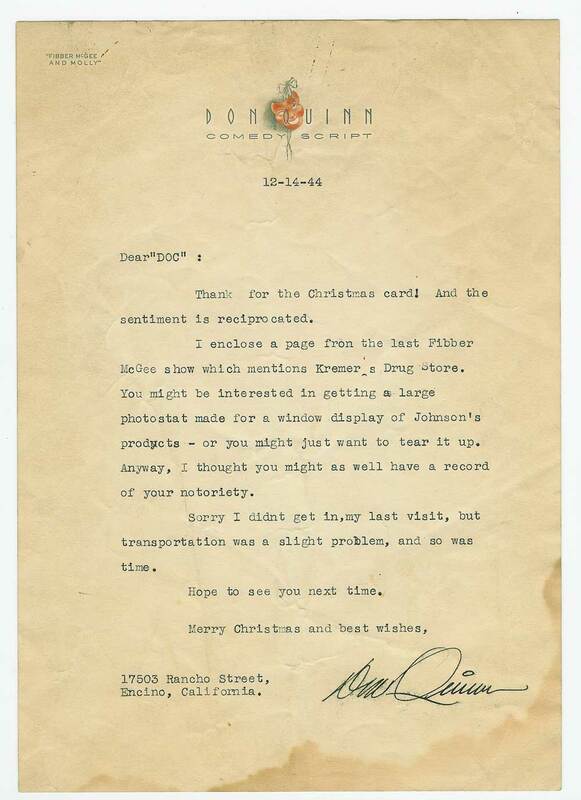 In the letters Don refers to ?Johnson? and ?Johnson?s Products?. The sponsor of the show for many years was Johnson Wax. 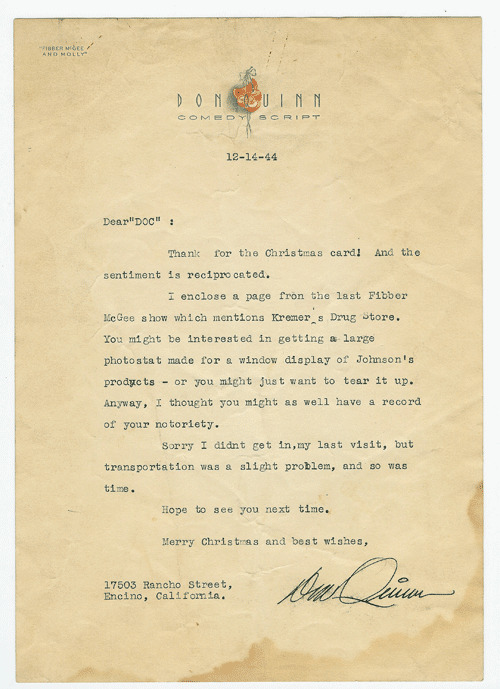 A letter from 1937 from Don Quinn to ?Doc? Kremer about one of the first times ?Kremer?s Drugstore? is mentioned on the show. Click for a larger version. 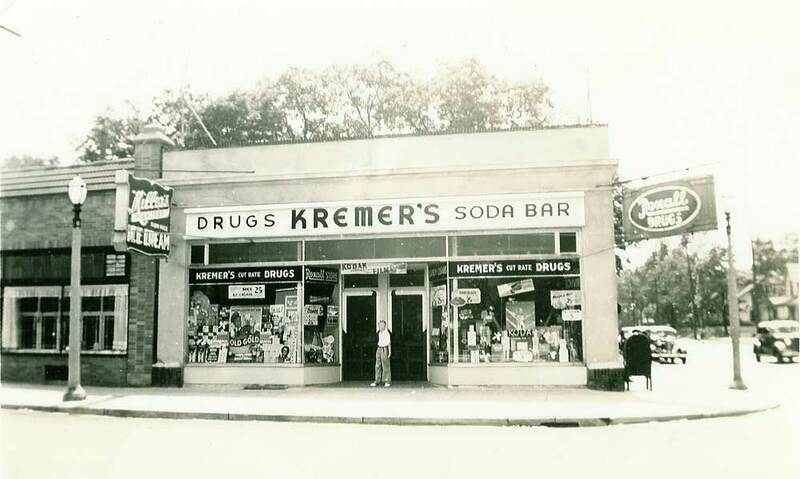 Kremer?s Drugstore circa 1938-1940. Click here for a larger version. The local Grand Rapids, Michigan newspaper did an article about the show, and they featured ?Doc? Kremer (right) as he sold a carton of cigarettes to a customer. 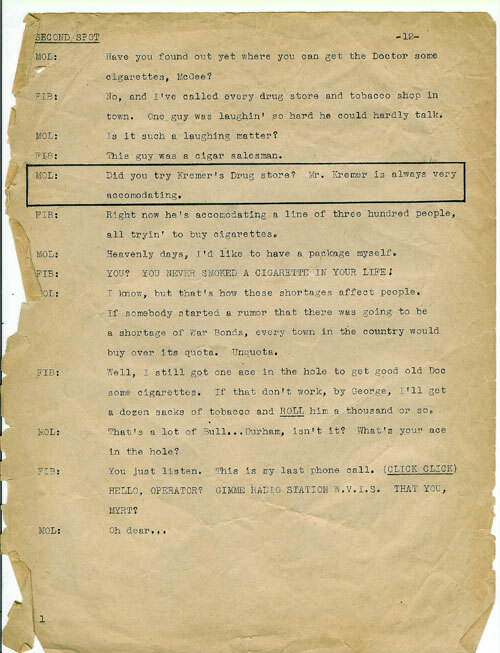 The story of Kremer?s Drugstore is featured in Mikey Smith?s Book ?How Fibber McGee and Molly Won World War? now available on Amazon.com. 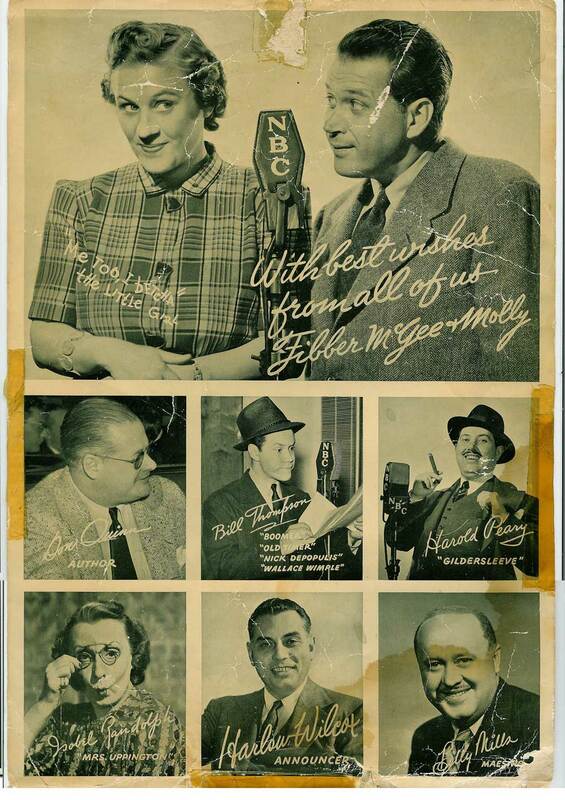 Free download of a Fibber McGee and Molly radio show from 1949. ?Kramer?s Cash Register? about Kremer?s Drugstore with the common mis-spelling of our name. Thanks for stopping by my site. 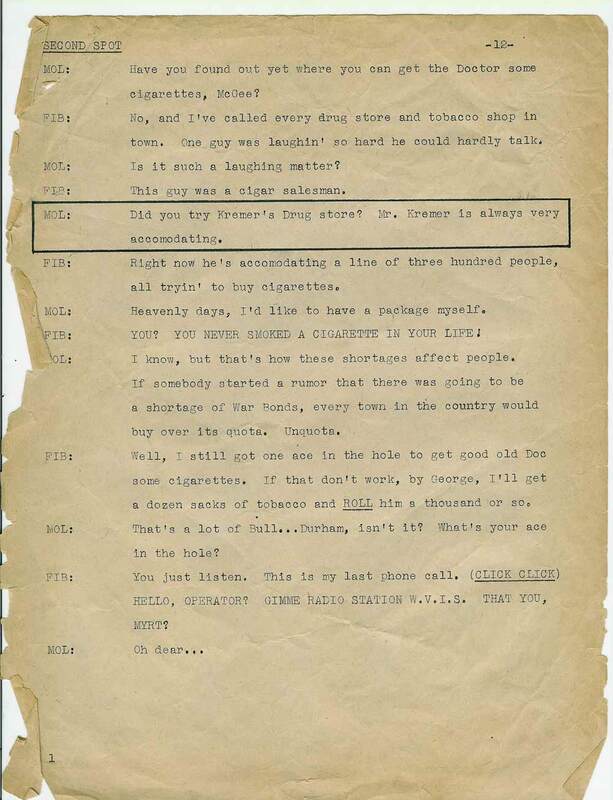 Fascinating article on your grandfather?s drugstore and his relationship with Don Quinn. You should know that I just picked out that particular episode off a Free Old Time Radio website., for no particular reason than to have a representative sample of the radio series to compare with the TV show?I know Don and the Jordans had a lot of their show based on a real person or place. Fibber and Molly has been one of my absolute favorite OTR shows over the years..When picking up a ?Public Domain: VHS tape of Petticoat Junction, it surprised me to see Don Quinn in the early episode credits as a writer..The surrealness of Wistful Vista definitely found its way to Hooterville..understandably so..Again, nice to meet you and have a good weekend.. Sorry comments are closed. It was too difficult to keep up with the comment spammers. You can always comment via Twitter. Follow me: @skremer. Click on the big blue Twitter button on the right side of the page.